data received from other agencies. Meta-data documented along with the data includes: time and space coordinates for the data collection, methods of sampling and analysis, quality control information and more. 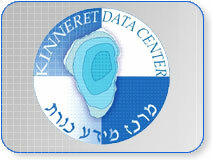 The main source of data at the Kinneret Data Center is the long-term monitoring program of Lake Kinneret (data since 1969) funded by the Israel Water Authority. Data collected in this monitoring program are published in annual reports in Hebrew. Lake Kinneret water quality – Graphical presentation of a series of water quality indicators showing monthly mean values. Water quality monitoring at the center of Lake Kinneret – Temperature, oxygen, pH, chlorophyll and conductivity updated at near real time. Long-term monitoring data – graphic presentation, updated periodically.